The AAL project FairCare was represented in various ways during the AAL Forum in Coimbra between the 2nd and 4th of October 2017. 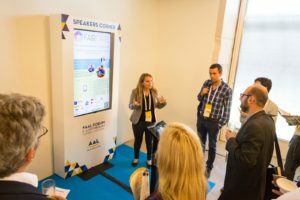 As it contributes to the knowledge generation within the AAL competence network of the partners University of Innsbruck, EURAC research and SIS Consulting GmbH, it was represented on the exhibition space of the University of Innsbruck. The platform prototype could be tried out at the exhibition space and flyers targeted to the scientific community were distributed. Moreover, FairCare took part in the poster presentations in the course of the topic “Innovative Business Model approaches”. The Social Franchise concept was presented as a method to overcome national boundaries and to contribute to the successful market implementation of AAL solutions after the project phase.